I’m not ashamed to admit that I am borderline obsessed with the movie Elf. That particular quote is one of my favorites, although as a dietitian I have to question the nutritional balance of a diet like that! Sugar is a popular nutrition topic these days, and it is generally all bad publicity. Want to know my opinion on it? It’s all about moderation. I’ve probably used the words “moderation” and “balance” a thousand times in my nutrition consulting sessions and on this blog, and that’s because I truly believe they are the key to a healthy and well-rounded diet (and life). I don’t believe that sugar in of itself is bad. One of the first rules of working with eating disorders is not to place judgment on foods or to label them as good or bad, because in essence, they aren’t. There are just different foods that serve different purposes. I like to point out that even water, which is typically considered “good” or “healthy” can be deadly if drank in excess. That being said, most Americans aren’t so great with the moderation piece when it comes to sugar. Sugar, in various forms, is added to a lot of food products, and some you might even not expect- peanut butter, breads, cereals (not just the little kid kinds) and salad dressings just to name a few. So it’s easy to over-do it. Excess sugar can definitely be a health problem, especially if done in excess over a long period of time and particularly for those with health concerns such as diabetes, heart disease, high blood pressure, and metabolic syndrome. The American Heart Association has put out guidelines for sugar intake: women should consume no more than 100 calories (6 tsp or 25 grams) of added sugar daily and men should consume no more than 150 calories (9 tsp or 37.4 grams). Those numbers are just for added sugars, so they don’t include naturally occurring sugars such as those found in fruit and dairy products, but that still isn’t a whole lot. 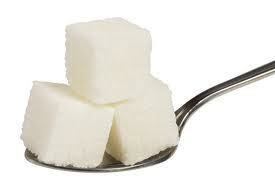 If you put 2 tablespoons of sugar in your morning coffee you’ve already met that number (if you’re a woman). Reportedly the average American consumes closer to 355 calories (22 tsp or 90 grams) from added sugars every day. Okay, so that’s quite a bit more than recommended, but honestly I think these guidelines are ridiculously difficult for the average American to follow, so don’t feel bad if your sugar intake is above those numbers, I know mine is. After all, what’s life without a little sweetness? That being said, if you have health issues such as those mentioned above you should definitely be careful about your sugar intake. If you are generally healthy, however, while it would still be wise to eat high sugar foods such as soda (which packs 40 grams of sugar per can on average) and candy in moderation, it would also be important not to be overly restrictive with your eating habits. This can set you up for problems with disordered eating and frankly makes life less enjoyable. Enjoyment is one of the purposes of food after all! Instead of dwelling on grams of sugar, focus on broader nutrition goals such as increasing fruit and veggie intake or making sure you get enough lean proteins and healthy fats. I would also like to point out that besides the enjoyment factor, there are other times when sugar can be appropriate, such as immediately before, during, and after endurance exercise when sugar is necessary for fuel. So sugar doesn’t totally deserve the bad rap. Me, I just ate a piece of chocolate as I was writing part of this blog. I might have 2 or 3, but I won’t eat the whole bag, and that’s what enjoying food in moderation is about!